When Mark Knopfler started with Dire Straits in 1977, he played two different Stratocasters. One of these had a laminated maple fingerboard and some other modifications, including one of the strap buttons at the back side of the guitar. Unfortunately photos that show the exact location of this button – is it near the neck plate or is the button held by one of the four neck screws – do not exist. With this blog post I will try to locate the button as close as possible with the help of the pictures and video we have. I have two Strats with a strap button on the back. On one it is held buy one of the neck screws, on the other it is screwed to the body wood near the neck plate, see the following pictures. Strap button with a neck screw (left) or near the neck plate (right)? Let’s now have a look at the first picture of Mark’s guitar now. It is from early 1978 and shows the guitar with the narrow brown leather strap Mark used back then. We can see that the strap runs along the inner side of the cutaway. I then tried to place my two guitars into a similar view angle as in the picture with Mark’s guitar. With the strap button on the neck screw (left) the results looks completely different than with the version on the right. So by now we can be almost sure that the strap button on Mark’s guitar was not held with one of the neck screws (with the inner screws the result would even be worse as you could not see the strap at all then). 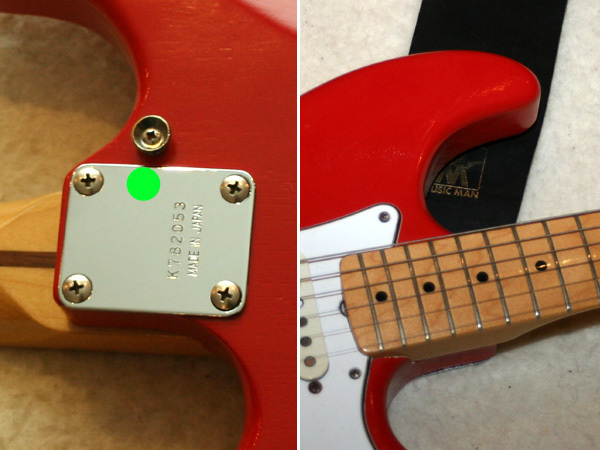 Theoretically the button can still be located near the neck plate as on mine guitar, or further down on the same line, e.g. just in the middle of the neck plate. To find out more, I will compare pictures with the wide Music Man strap next. The Music Man logo on the strap can partly be seen behind Mark’s guitar on several pictures. As I have an identical strap, I might place the strap similar and check where the hole at the end of the strap sits. Here is a picture of Mark’s guitar again. Finally I move the Music Man strap around a bit to find even better alternatives. With the strap hole located at the green circle the result looks like this. With the button in the middle of the neck plate it will look like this. It turns out that in fact the most accurte placement seems to be as it is on this guitar. The real position can only differ about some millimeters or 1 – 2 centimeters at the maximum (+/- ca. 0.5 “). Why the strap at the back? Mounting the strap button at the back of the guitar has in fact some advantages. Even with a wide strap like the Music Man strap, the strap lies flat to your body which feels (and looks) a bit different, maybe better. And we must not forget that the guitar that Mark Knopfler mainly played before getting his first Strat in 1977 was a 1959 Les Paul Special. 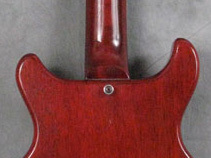 On this the strap button is located at the neck heel (see picture) so this is what Mark was used to, and it makes sense that he asked the luthier who did the modifications on that guitar to mount it there as well. If you want to place the strap button on the back of your guitar, you might nevertheless do it as I did with the other guitar. You only have to widen the hole in the strap button (I used a drill) and use the same screw to hold it. From my experience the neck will sit firmly enough with one screw not in completely. You can undo this mod any time. If you decide to screw the button into the wood, you might use a piece of clear masking tape and drill through it. This should prevent from cracking the finish around the hole while drilling. Remove the tape after the job is done. Mark gave this guitar to a luthier called Sam Lee (or Sam Li?) in Soho for these modifications. the maple fingerboard and this famous strap button located at the back of the guitar were made by a repairman called Sam Lee. An article wrote by Seymour W. Duncan titled “Jeff Beck The Tele-Gib” delivers some informations about a certain master repairman “Sam Lee”. Sam Lee had a repair and vintage shop with Steve Howe who played in the group “Yes”. which recent french guitar mag please ? the maple fingerboard and this famous strap button located at the back of the guitar were made by a repairman called Sam Lee. <<< This is not a confirmation from a second souce. It simply shows that all these magazines copy information from my site! Honestly, I read info (incl. mistakes) from here in all kind of magazines that write about MK all the time, they just do their research which means they google for info and find it on my sites. 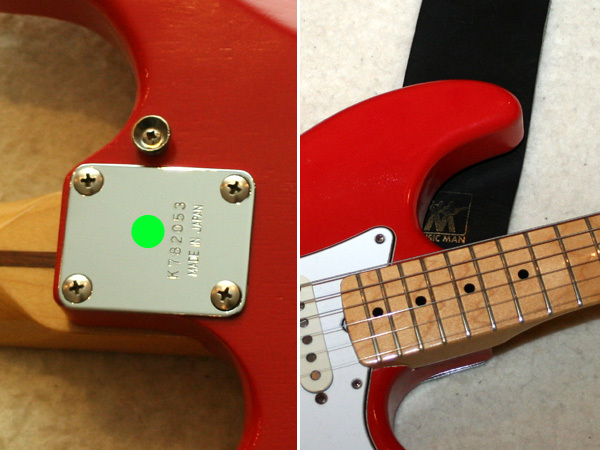 Thanks for making this article it was really useful, I am defiantly going to this to my guitar, would I be better put the button a little higher than on yours to get a more accurate result?, and what would be the best way to fill the hole in and then repaint it? Just curious about the frets on your two red starts shown is this article. The darker red one (on the right in the first photo where both are shown from front) looks like it has a thinner frets while the lighter red one, on the left, looks like it has 6105. Which are the frets on both guitars please? 6105 (left) and Fender Medium Jumbo (right)? There are a few shots from rear angles, but it’s still kind of hard to tell exactly where it’s mounted. 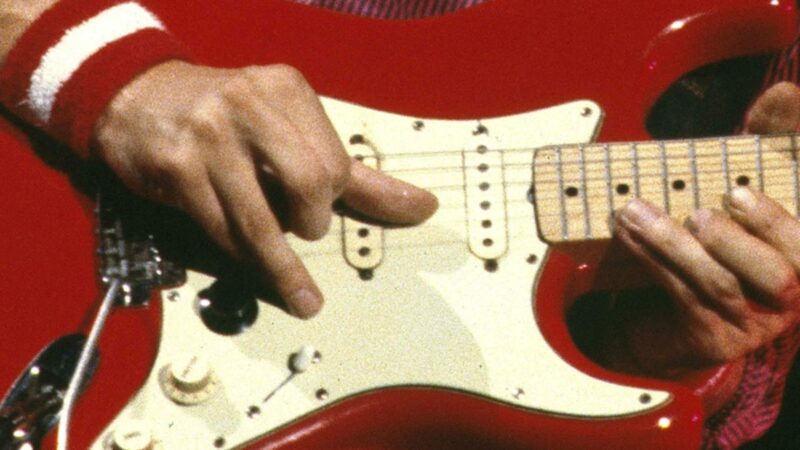 To me it looks like there were no 2 red strats from Mark. He replaced the rosewood neck to a maple neck on his red strat. Please check out the “Arena” Video from 1980. First this guitar is shown with a rosewood neck and later on during rehearsal sessions it is a maple neck. You can see it´s the same guitar from the damaged pickguard at the top of the middle pick up. Also exactly the same replacements for the tone and volume control. I don´t think he bought another strat and made the same damage on it. Makes no sense at all. I´m a Dire Straits fan since 1978 and also play guitar since a few decades. I never noticed that but only today after watching the Arena Video again. Ingo what do you think about it? I think I´m right or not? They are two different ones. The one with the rosewood neck is a bit lighter red and has the strap button on the upper horn, as normal. The other one is a bit darker and has the strap button at the back. But you are right, the pickguard is the same, Mark seems to favour the pickguard from the rosewood neck Strat and put it on the maple neck Strat on most tours. The original pickguard of that guitar can e.g. be seen in the Rockpalast video. You can see both red Strats in the Arena documentary, in the video of Twisting by the pool, where David plays the onw with the rosewood neck. Both are refinished in red.